One of the most important activities of industrial engineers is the improvement of processes in an organization. For this purpose, industrial engineers develop improvement techniques and apply these in various organizational areas. Traditionally, lean manufacturing plays an important role in these improvement efforts, and many times “going lean” has proven to be quite beneficial for companies. However, these benefits have often been restricted to the operational processes in the company while management processes have remained unaffected. This means that, in addition to lean, a more holistic improvement approach is needed to turn a company into a high performance organization (HPO). The HPO is defined as “an organization that achieves financial and non-financial results that are exceedingly better than those of its peer group over a period of time of five years or more, by focusing in a disciplined way on that what really matters to the organization”. The management of an HPO is of high quality, builds relationships based on trust by combining integrity and coaching leadership with highly exemplary behavior, is quick to make decisions (also regarding non-performers), and is result-oriented and committed to a long-term vision. The culture of an HPO is an open one in which everyone is involved in important processes through shared dialogue, continuous knowledge sharing and learning from mistakes. In an HPO change is encouraged and mistakes are allowed. An HPO is aware of its distinctive (strategic) characteristics and has all employees continuously contributing to improving, simplifying, aligning and renewing processes, services and products. To an HPO, continuity in the long term always takes precedence over profit in the short term. The long-term orientation of an HPO applies to clients and collaboration partners, but also to its managers who are promoted from the ranks. In order to make the HPO Framework tangible and practical for organizations, to allow them to use the framework for improving themselves, I developed an HPO Diagnosis, shown in Figure 1. The HPO Diagnosis consists of six consecutive steps, with steps 3, 4 and 5 being optional. 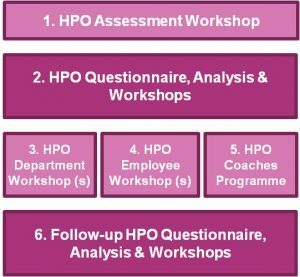 Step 1 of the HPO Diagnosis consists of a workshop with senior executives in which a short HPO assessment is made of the organization, based on the views of the executives. As part of the assessment participants fill in the HPO Questionnaire, consisting of questions based on the 35 HPO characteristics with possible answers on a scale of 1 (very poor) to 10 (excellent). After this, the HPO scores are calculated and analyzed by the HPO Center. The scores for the five HPO factors (HPO scores) are visualized in a graph. This graph indicates whether the organization is an HPO or not; to be an HPO the average HPO scores of each HPO factor have to be at least 8.5. The graph also shows which characteristics need to be improved to increase the performance of the organization. The HPO Framework, the results of the analysis and the HPO graph are discussed with senior executives, to increase the understanding of the persons who are going to work with the HPO Framework. Step 2 of the HPO Diagnosis is a full HPO analysis in which as many people at all levels of the organization fill in the HPO Questionnaire, to obtain a complete picture of the organization. The HPO scores are calculated for the whole organization, its business units and its organizational levels (senior managers, managers, employees). Subsequently, interviews are held by the HPO Center with a selection of staff from across the organization to ‘get the stories behind the figures.’ The data and interviews are analyzed, to identify the points which have to be improved and strengthened in order for the organization to become an HPO. The analysis results are shared then with senior executives and management in an awareness workshop to increase the understanding of those that will be working with the HPO Framework, the current HPO-status of the organization and the ‘HPO attention points’. This is followed by a call to action workshop in which senior executives, managers and the HPO Center discuss possible actions to address the HPO attention points and an action plan is drawn up. The action plan consists of two parts: (1) What improvement actions are needed to increase the quality of senior executives and managers and make them high performing individuals? (2) What improvement actions are needed to address the HPO attention points of the organization? Furthermore, the roll-out of the HPO Diagnosis in the organization is developed. During step 3, the HPO Diagnosis is taken a level deeper into the organization. A detailed analysis of the HPO scores is made per organizational unit (department, business unit, country) and additional interviews are held, to identify the HPO attention points for each organizational unit. The analysis results are shared with management and unit heads in an awareness workshop and a call to action workshop. The action plan which is developed during the latter consists of three parts: (1) What improvement actions are needed to increase the quality of the managers and unit heads and make them high performing individuals? (2) What improvement actions are needed to address the HPO attention points of the organizational unit? (3) What improvement actions are needed to address the HPO attention points which lay outside the sphere of influence of the unit and have to be addressed on senior management level? Furthermore, the roll-out of the HPO Diagnosis to the employees in the unit is developed. In step 4 of the HPO Diagnosis the employees get a full debrief of the HPO scores and attention points of their unit, conducted by the unit’s managers and team heads, coached by the HPO Center. This is again done in an awareness workshop and a call to action workshop. During the latter workshop an action plan is developed consisting of three parts: 1) What improvement actions are needed to increase the quality of the employees to make them high performing individuals? (2) What improvement actions are needed to address the HPO attention points of the organizational unit and what are employees going to contribute? (3) What improvement actions are needed to address the HPO attention points which lay outside the sphere of influence of the unit and have to be addressed on senior management level? 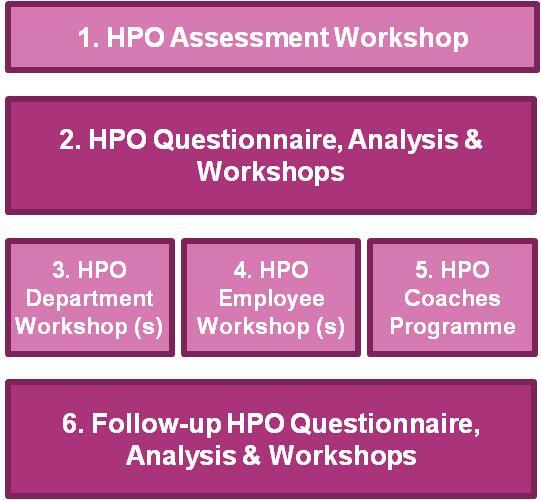 In step 5 a network of HPO Coaches is set up, consisting of people from different units and organizational levels. The task of the HPO Coaches is to promote the HPO culture and support management in its endeavors to make the organization an HPO. The HPO Center trains these HPO Coaches in getting an excellent understanding of the HPO framework, its application, the organization-specific diagnosis results, and possible ways to improve the HPO attention points. The presence of HPO Coaches promotes HPO leadership in the organization and also makes sure the HPO knowledge stays alive in the organization after the HPO Center has left. To evaluate which progress the organization has made, a second HPO diagnosis is conducted in step 6 after 1½ to 2 years. The activities of this step are the same as in step 2 (and possible steps 3 and 4) with the difference that they are performed by the HPO Coaches, supported and coached by the HPO Center. The aim of the second diagnosis is not only to see in which units progress was made and where not, but also to identify additional HPO attention points so further improvements can be achieved. Employees are more aimed at improving their results; they feel more responsibility toward continuous improvement of products, services and processes within the organization. They also take more initiatives in experimenting on new fields of improving. The company was therefore able to introduce – with success- more often and faster new products and services to the market. The employees have a positive mentality and attitude; they think more in resolving problems than in problems. They are proud to work for the company. A renewed élan arises and a feeling of shared goals: to be an HPO and to stay an HPO! Employees are working more together with colleagues from different units as well as with suppliers and clients. They have a more open mind toward ideas from other parties and they think and work less in silo’s, because they feel themselves to be a vital link in the organizational process that should be effective in total. There is a more mutual trust between the employees which makes it easier to build a good relationship and understanding. People are more interested in each other and managers are more sensitive towards wishes and need of their employees. This process is supported because there is more openness within the organization and there is more frequent opportunity for dialogues between managers and workers, and more knowledge sharing between organizational units. The organization is more able to develop a strategy which is unique compared to the peer group, and this strategy is unique in content and/or execution. Thus the organization distinguishes itself strongly from competitors and is therefore more attractive for (new) clients and for (new) employees. There is more focus and discipline within the organization which is expressed in more successful executed projects. The organization obtains a quality reputation by better service, less problems and mistakes and better fulfilling the needs of the clients. In addition, employees feel more socially responsible and undertake all kinds of social activities that benefit society. These non-financial advantages translate also into better financial results. The productivity rises because the same number of people do more, with more success. Profitability is rising because costs are decreasing and turnover is increasing. In non-profit organizations more is done and achieved for the same budget. Because costs and budgets are better under control, these organizations are financially more stable. Because turnover and profitability increase and the organization is more attractive for customers, the market share is rising. This results in a top position in the sector. As the organization achieves a higher HPO score, it will result in a higher place on the ranking list of the industry. As these benefits clearly show: it pays to become an HPO! As such, the HPO Framework could and should be the improvement technique of first choice for industrial engineers in their efforts for continuous improving organizations. In addition, they can still use lean management as the choice technique for specifically strengthening the HPO factor Continuous Improvement and Renewal. As a result industrial engineers can take the next step in their improvement activities as they now have at their disposal a full range of improvement techniques that can help lift both the operational and managerial processes of an organization to a world-class level. Many industrial engineers either work in the production or professional services industries so it should be interesting for them so see which HPO issues they probably encounter in their organizations when striving for excellence. Figure 2 depicts graphically the average HPO scores for all the production and professional services companies collected in the HPO database of the HPO Center. The first thing that strikes is that the average HPO scores for both industries are exactly the same (6.8) and that also the shape of the HPO graphs are more or less the same. This means that industrial engineers in both industries can expect to run into the same issues when working to improve their companies. For both industries the main issues have to do with the HPO factor Continuous Improvement and Renewal. When looking into the detailed HPO scores in Appendix 1, it becomes clear that the process of process improvement (characteristics 2, 3 and 4) has to be improved. Although the score for HPO characteristic “In our organization processes are continuously improved” is quite acceptable, meaning that there are more than enough improvement ideas and initiatives, the scores for both “In our organization processes are continuously simplified” and “In our organization processes are continuously aligned” is not nearly sufficient enough. These scores clearly indicate that although we start enough improvement initiatives, we don’t seem to finish these or at least not completely and within budget and with the desired results. Thus, we need more discipline to start less improvement initiatives and seeing these through to the end. Another area of interest is that of strategic performance management, represented by the HPO characteristics “In our organization everything that matters to the organization’s performance is explicitly reported” and “In our organization both financial and non-financial information is reported to organizational members.” Both characteristics have a fairly low score, meaning that many people in the organization do not get the right information to do a top-notch job. This is a great nuisance to industrial engineers who do like facts and figures in their work. It therefore stands to reason that industrial engineers team up with both operational excellence people and financials to start improving these important characteristics, thus strengthening HPO factor Continuous Improvement and Renewal and thereby helping their organization to become an HPO! Read the article ‚Continuous improvement: the next step for Industrial Engineers‘, published in the December 2014 issue of Industrial Engineer, in PDF! Dr. André A. de Waal MBA is academic director of the HPO Center in the Netherlands (www.hpocenter.com) and associate professor at the Maastricht School of Management, the Netherlands. Dr. de Waal has published 26 books and more than 300 articles on high performance organizations and performance management. His latest book is called What Makes A High Performance Organization: Five Validated Factors Of Competitive Performance That Apply Worldwide (Global Professional Publishing, 2012).